The platelet count increased to 294, but the medical treatment was changed. It may or may not be. From personal experience, I responded to IVGs the first 3 or 4 times, but did not respond the last time. It is probably worth getting a CBC done. Have you done any permanent treatments? Petechiae can be a symptom of low platelets, but I don't see much on that picture. This is what it looks like, although it doesn't have to be quite that bad. 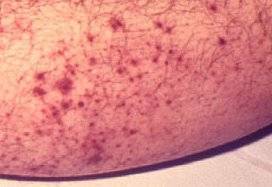 A few petechiae may not be anything to worry about. If it gets worse, have a count done. Vdeutsch85 wrote: It may or may not be. From personal experience, I responded to IVGs the first 3 or 4 times, but did not respond the last time. It is probably worth getting a CBC done. Have you done any permanent treatments? I was nearly finish the treatment, since my platelet count increased to 279 in Apr 2013. However, it dropped to 188 and 4 within a week in May 2013. We have no idea why did the platelets dropped dramatically? did my treatment too light or not? My doctor arranged a blood test for me this weekend, since I'll have a follow up consultation with him next week. Although petechiae doesn't too much, I was bleeding when I brush my teeth and it's take a long time to stop bleeding this morning. Therefore, it must be the signal of low platelets count. Is it possible to perform another IVIG treatment after a week of previous one? Hi drbean, when I was first diagnosed way back in 2004, I did IVIG every week for a year until my hema dr. decided it wasn't working. I was also on Pred at the time. I know a drop from 279 to 188 seems like a lot, but that is what happens with ITP, especially after IVIG which does not last long. 188 is still in normal range. Are you using the Tranexamic acid even with high counts? I hope not! That is a lot of treatments at one time. Do you have a lot of side effects?. I will be curious to see what your counts are. From personal experience, I did not respond to prednisone and I was at 4 last week on cyclosporine. I also did a failed round of rituxin. The only thing that seems to be effective for me is Nplate. I hope your counts go up soon! Vdeutsch85 wrote: That is a lot of treatments at one time. Do you have a lot of side effects?. I will be curious to see what your counts are. From personal experience, I did not respond to prednisone and I was at 4 last week on cyclosporine. I also did a failed round of rituxin. The only thing that seems to be effective for me is Nplate. I hope your counts go up soon! When do you get your next CBC? From reading your data, it seems like things will work and then your body fails to respond.Have you talked to your doctor about Rituxin? It did not work for me, but it has put several people into remission on here. It's 50% success rate. There are people on here that have responded well to TPO's as well. There are two ladies who have just started on Promacta. As I have said I'm on Nplate and it has gotten my counts up the past 6 weeks ( however, my doctor isn't that smart and said because I was above 150 he didn't give it to me, but after getting a 2nd opinion, that explains the crash). Both of these drugs have a very high success rate. I'm back to hospital, the latest platelet count is 3. Oh no I hope your counts go up soon! I find those sharp drops very anxiety producing. You feel fine. You think, "Oh, my count has to be good because I really feel good." But you know that has nothing to do with anything. And the idea that counts can tank in such a short time is rather terrifying. But just because they drop does not mean that anything terrible will happen. Low counts do not automatically = death. There are other clotting factors that come into play and the body does some neat things to protect itself. There are so many people that have had fast drops like that several times and they are still here to tell about it. As long as there is a way to get them up and you are aware of your symptoms, you'll be okay. Roberta, I'm not sure if you were aware of this or not, but Vitamin C can help symptoms a bit. It improves the strength/integrity of blood vessels making a bleed less likely. It can also help bruises to be less severe. It wouldn't hurt to start taking some. Vitamin C is required for the synthesis of collagen. It is an important structural component of blood vessels, tendons, ligaments, and bone. Vitamin C helps some of our most important body systems like the skin, bones, teeth, blood vessels, cartilage, tendons and ligaments depends on collagen. And the integrity of collagen, in tum, depends on vitamin C. It also increased bowel tolerance phenomenon serves not only to indicate the amount which should be taken but indicates the unsuspected and astonishing magnitude of the potential use that the body has for ascorbate under stressful conditions. Vitamin C is one of many antioxidants. Antioxidants are nutrients that block some of the damage caused by free radicals, which are by-products that result when our bodies transform food into energy. Vitamin C also helps prevent atherosclerosis by strengthening the artery walls through its participation in the synthesis of collagen, and by preventing the undesirable adhesion of white blood cells to damaged arteries. An adequate intake of the vitamin is highly protective against stroke and heart attack. I think I'm good on Vitamin C. I drink OJ and Grape juice and eat tons of fruit and tomatoes every day. Plus take a multivitamin. Roberta, if your count drops but you don't realise because you have no symptoms, that could actually a good thing! If you have no symptoms on the outside, then the likelihood is that you have none of the more serious ones on the inside either. And even bruising and petechiae aren't really significant. The symptoms doctors worry about are active bleeding - nosebleeds, blood blisters in your mouth, GI bleeding etc. If you don't have those, then you are probably ok regardless of what your count is. Doctors are supposed to grade the severity of ITP according to symptoms and not counts and I think thats a really helpful way of looking at it for patients too. Enjoy Disneyland with your grandchildren, and try and forget about ITP as much as possible! I had the mouth blisters and blood in my nose but not dripping. Plus the worse petechiae anyone had seen. So they hustled me into a hospital room. We got our first two bills for the two week stay. So far it was about $220,000! Yikes! So far we have to pay about $800 but my husband thinks another bill will be coming. He was going to quit work the week I went in but we changed our minds about him quitting right now! I do have medicare, but I have no idea how good that is. Seems with regular insurance and medicare supplemental, it should all be paid! I am going to proceed last day injection of ivig and hand in my homework after the injection. I don't want to take surgery, since I haven't tried other alternatives before, it may have a chance to reach remission. Just be sure to do your research before going for the splenectomy. It doesn't always work and as you said, there are other options. Well, that percentage drops over time. I wouldn't do it just so he can close his file. I have gotten that impression from my first doc too. Do your research and figure out what is best for you! I am back to home today and resume my job duty this Friday. Vdeutsch85 wrote: I have gotten that impression from my first doc too. Do your research and figure out what is best for you!